Brussel sprouts are pigs. Well, they aren’t actually pigs or Jay would achieve his dream of harvesting bacon from the garden. But for what they provide (those little cabbage nuggets of goodness), they take a long, long time to grow and take up a lot of space. 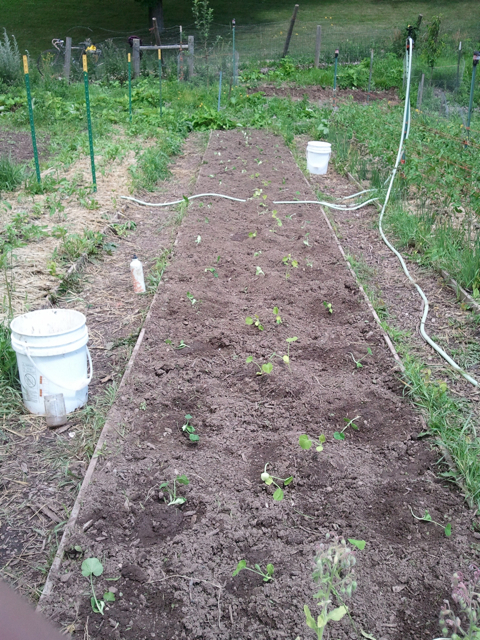 I could get more out of the small plot with other vegetables. I’m thinking garlic and onions. 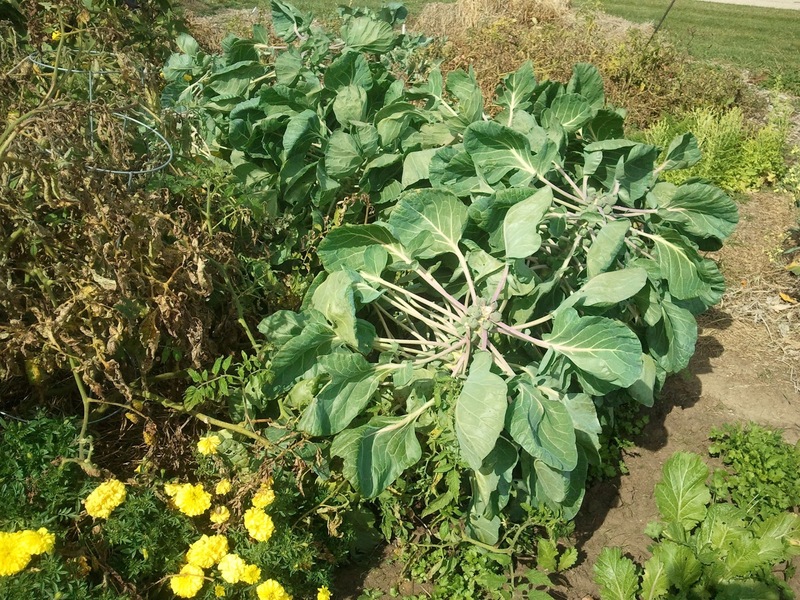 Eight brussel sprout plants took up A LOT of room in my 10x10 garden plot. Garlic planted in the spring yields, but not much. I was warned that garlic planted in the spring would not yield much, but I’m happy with what I got for an early June planting. I can’t wait to see what October planted garlic produces! Garlic planted in late spring yeild small but tasty crowns. 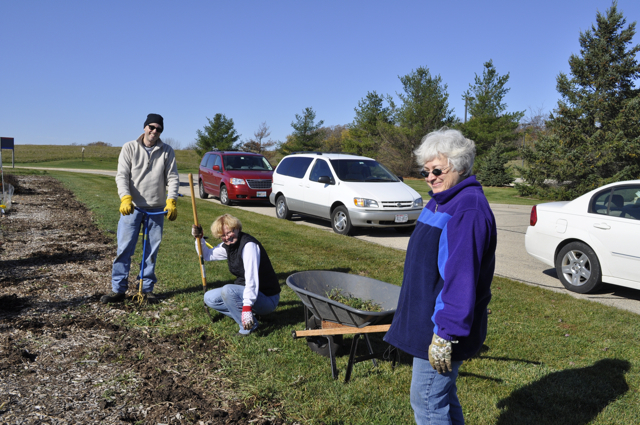 For 2012, I'm planting in late October 2011. It’s ok to trim back an indeterminate cherry tomato plant. We planted one sungold cherry tomato plant which took up half a garden bed alongside our garage. 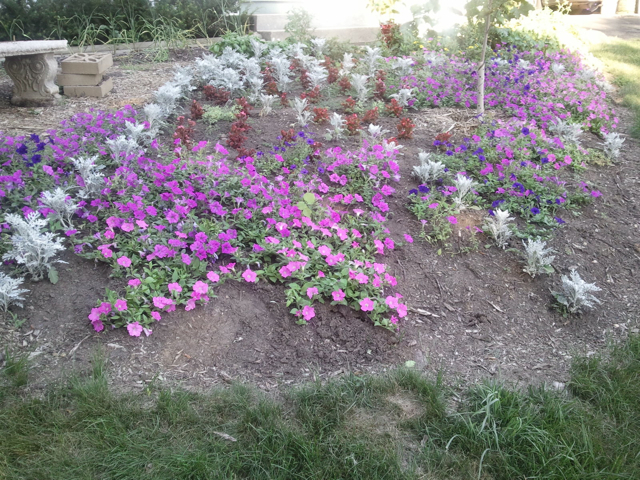 It produced like crazy, and in October, it was still blossoming flowers. Had I trimmed it back, we would have gotten more fruit off less plant. 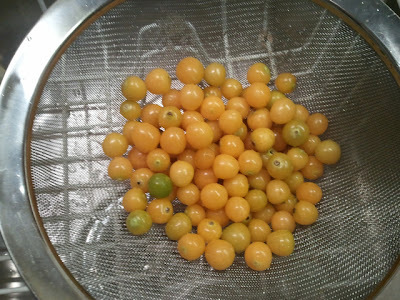 Yes Virginia, that's ONE sun-gold cherry tomato plant. 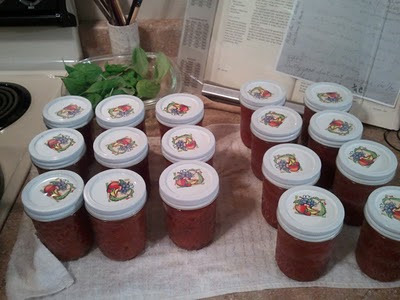 Indeterminite tomato plants are not good for canning. Well, they are and we did. But we didn’t get a lot of ripe fruit at any one time. 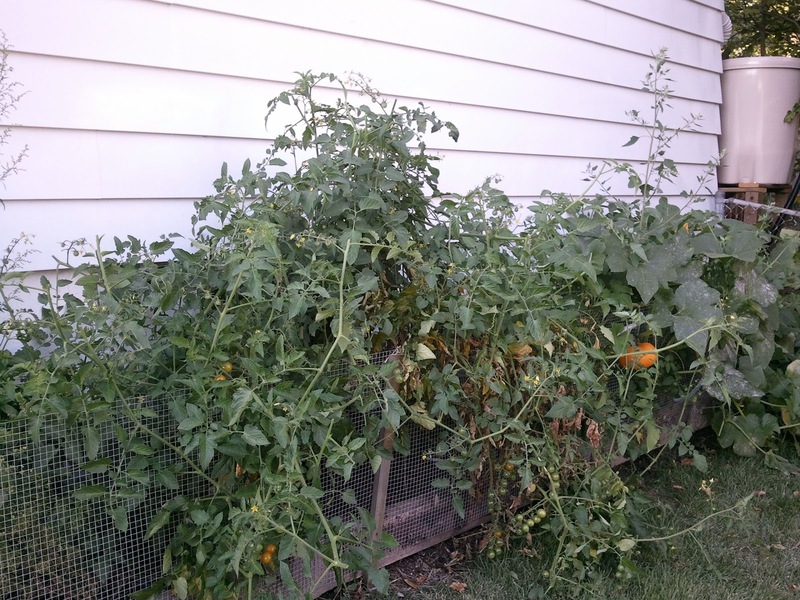 Next year, one indeterminate slicing tomato, and several determinate beefy and paste plants. 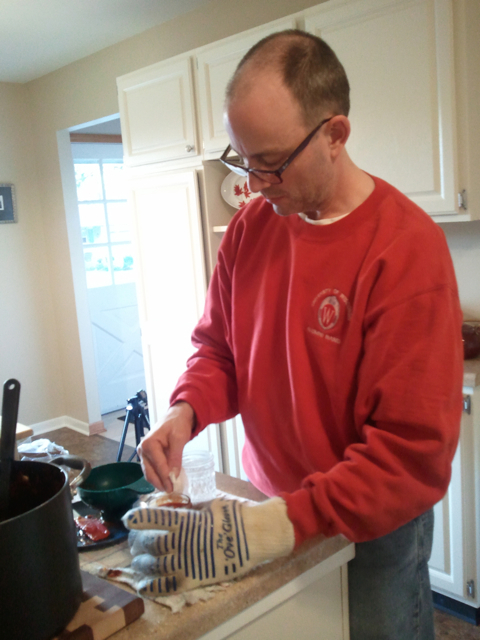 We made marinara sauce with whatever was on the vine at the time. Careful when co-planting. I read that nasturtium plants ward off a disease (or insect, can’t recall) from eggplant. So I planted several among my eggplant. 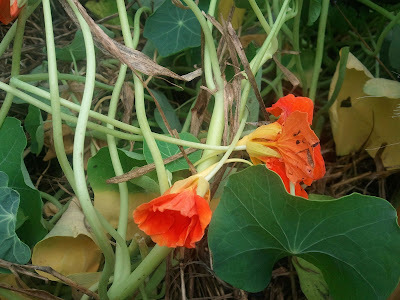 The nasturtium grew faster and I think competed with and did little to help the eggplant. 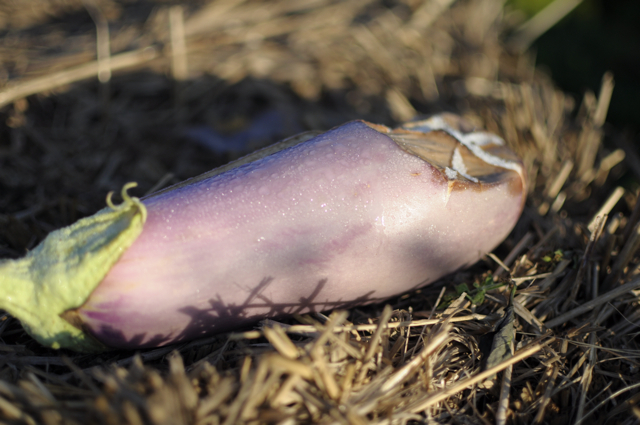 In August I tore them out and if I’m not mistaken, it seemed that that’s when the eggplant really started to thrive. It was too late for those blossoms to turn into anything but compost. Give the Malabar more trellis. My friend Diane shared two of these viny spinach plants. I tastes great, nothing seemed to kill it, lasted all summer and into autumn and gave the nasturtium next to it a run for its money. We are definitely planting this one next year. But it needs a bigger trellis and we need to more aggressively nibble at its succulent leaves. Buy vs. start. I’m still 50/50 on this one; because I haven’t done the math, I don’t know if it’s more cost-effective to buy and start seeds under grow lights or purchase plants from the farmer’s market, etc. I spent $10 on seed packets for basil, eggplant and some flowers. But that doesn’t include electricity spent on lights and heat mats. 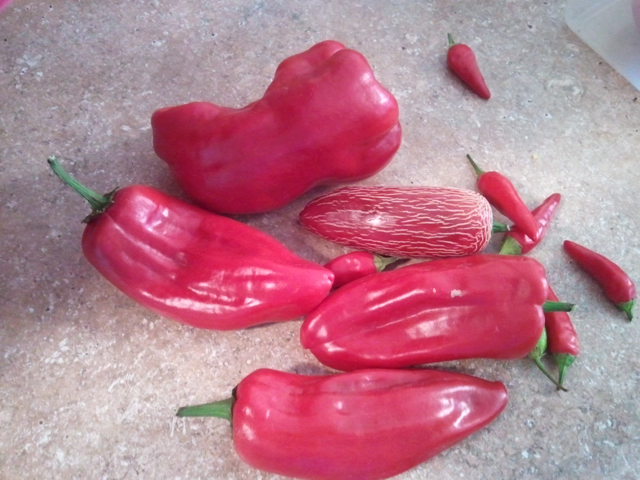 I spent $50 at the farmer’s market for the rest of what I put in the garden. The thing about starting from seed is I have all these leftover seeds, and I have to buy many packets to get the variety I want. 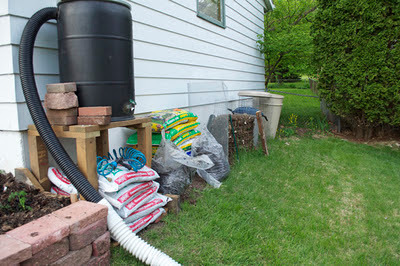 I think the key is to plant what I need lots of (basil, eggplant) and buy what I want a few of. 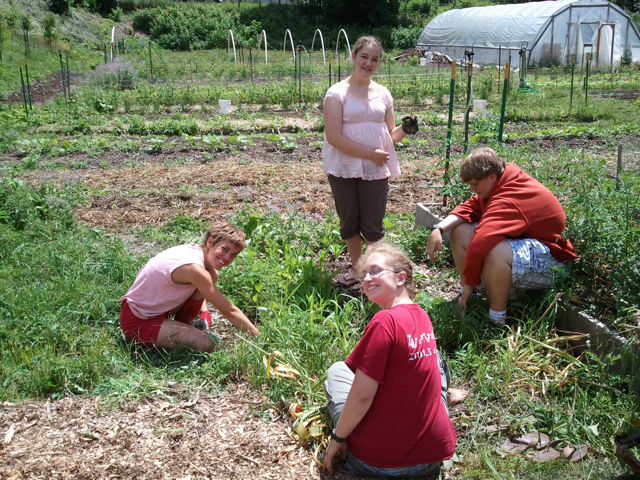 OR, I’d like to get into a seed starting cooperative, i.e. I start the basil for everyone, someone else starts tomatoes, etc., or I just get people to pay me for plants I start? Oh boy, that sounds like trouble. Nothing says "spring" like loose soil and seeds under grow lights. I love to be in the garden at 6 in the morning. It’s quiet and peaceful. Sometimes it’s foggy and a little mysterious. I have the whole place to myself, yet I’m sharing it with lots of other people. 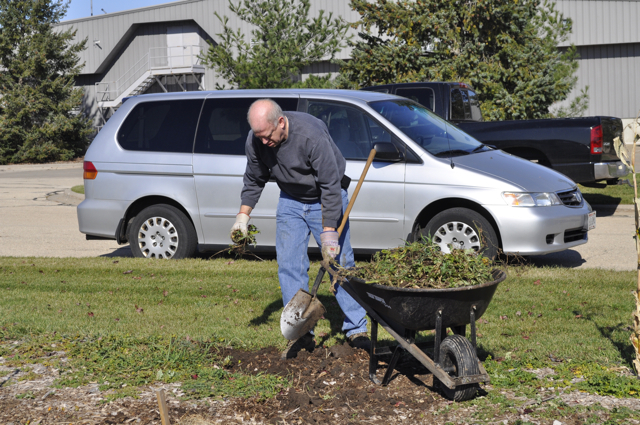 The day is just starting, and I have time to prune, pick or care for the plants. The hawk watches me, the chipmunk, me, the rabbit, me, the ground squirrel, me, the mouse, me, the mole and then me as I drive off to start my day. 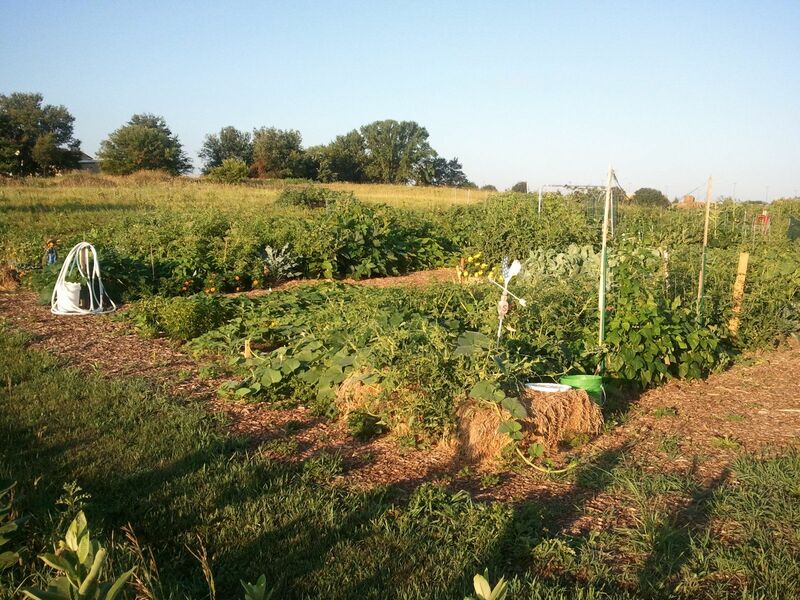 An early morning sunrise casts long shadows on the sleepy community garden. If the world goes to hell, we could provide for ourselves. If an economic, social or military apocalypse happened, I’d scrape together some seeds and move to my parents' farm in western Wisconsin where Jay and I, along with my family, could grow and preserve our own food. Variety would be slim and we’d have to be thoughtful about getting a balanced diet (what is high in vitamin C that grows at our latitude?). But I learned that I could do it. Top 10 lists need 10 entries. Letterman’s 10th item is usually the ringer, the gotcha, the really good one. Mine? Mine is the obvious – I learned that I have much to learn. Why did every single Japanese truffle tomato split on top and get this black stuff in the splits? I don’t know, but I’m not going to plant them again. Why weren’t my eggplant prolific? I don’t know, but I’m going to try again. Why oh why did I not stick to my “plant cilantro every other week all summer” plan, again? I don’t know, but I’ll make an effort again next year. And so on. 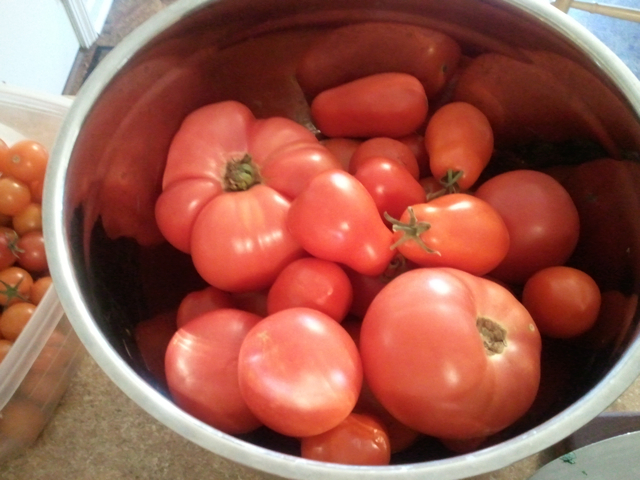 Perhaps this is why people garden up until they are dead, because there is much to learn, but despite not knowing much, at least I got a few tomatoes. In late May, I planted garlic from a few crowns from my local green house (I favor Johannsen's Greenhouses & Gifts on the Beltline, good selection, incredibly knowledgeable staff). I knew it was late but I had this patch of dirt with nothing in it and I wanted to see how it would go. 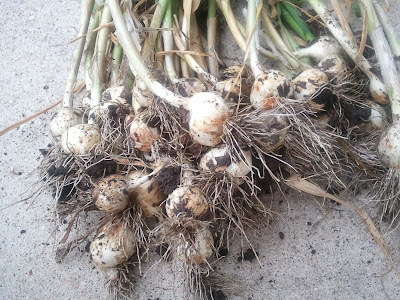 I harvested my garlic plantation in late July and I'm now hooked on growing garlic. 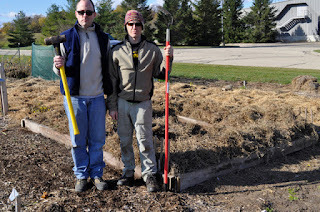 Planting and care were easy, garlic stores well and there's nothing like garlic in the winter to fend off the snowy blues. And mine is organic to boot! I decided to buy a variety of garlic to plant this autumn and went online to see what's out there. 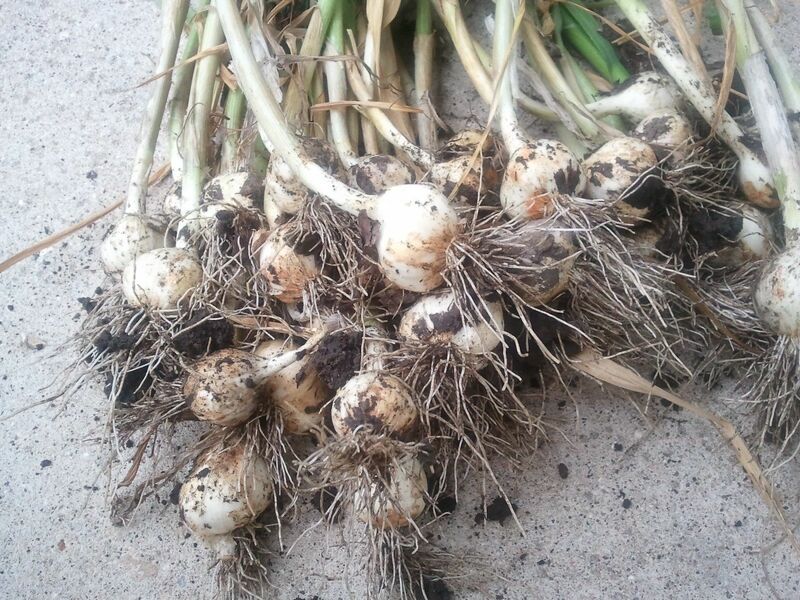 Don't do it if you have no will power and a credit card at hand - there's a lot of garlic to be grown. I found Territorial Seed Company in Cottage Grove, Oregon (now that's going to be confusing for my Madison friends) and found a two-variety pack, one pound each. 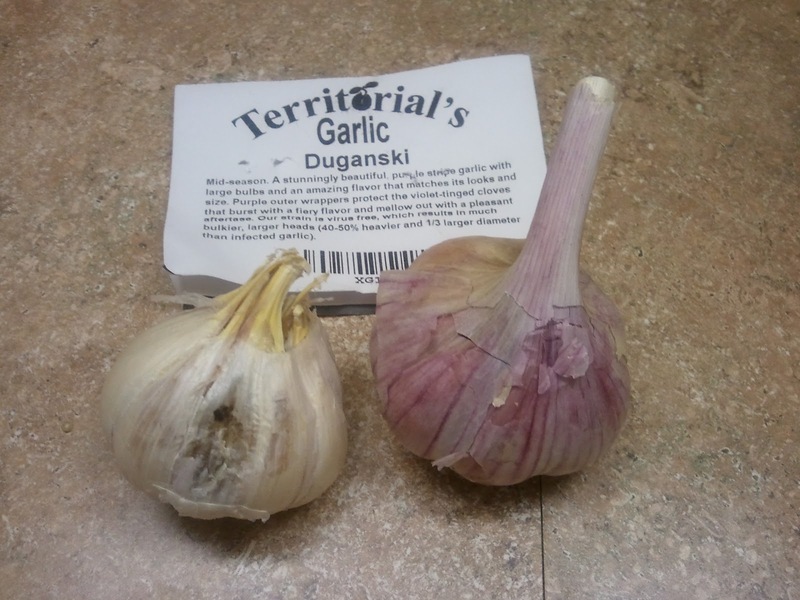 Two pounds of seed garlic cost $42.50 with shipping. But, I'm sharing it with friend Jason and my mom, so after we split it, not bad. Last night as I was splitting up the order, I noticed one of the cloves was a bit mushy. And at $42 for 16 cloves, each one is about $2.60. Ok, no big deal, but I thought for this price (the ones at Johannsen's were about 1.50 each) it would be worth a try to ask for a new clove. I took a photo of the mushy clove next to a healthy specimen and sent an email to customer service last night. When I got home today I had two emails from Territorial Seed Company. First was an apology and word that they would send a replacement. The second was a notification that the replacement had already been shipped. Ok. That's cool. And great service. Thanks Territorial Seed Company, you are awesome! Ok, so oops they sent a lousy clove. They're sending a replacement. How cool is that?! 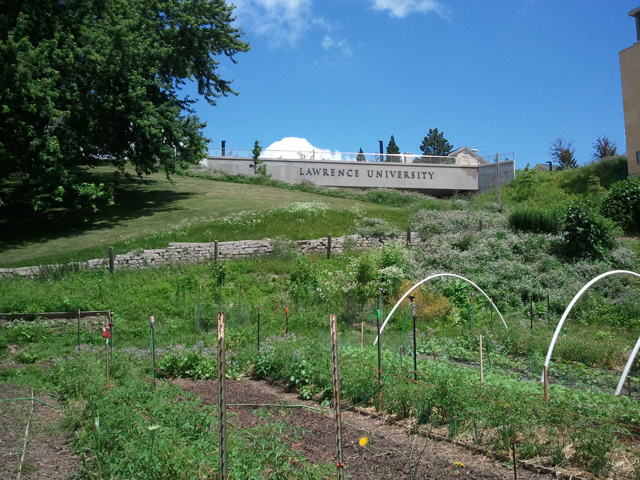 I love learning, and I love food, so it should come as no surprise that this spring and summer's gardening adventure has me learning and cooking, a lot. Some of the best learning is the informal kind, a passing comment that makes not just a light bulb, but an entire Christmas tree go off in my head. That happened today. This morning, my co-worker and fellow American Family Community Gardener Nate walked by my desk on his way to his. 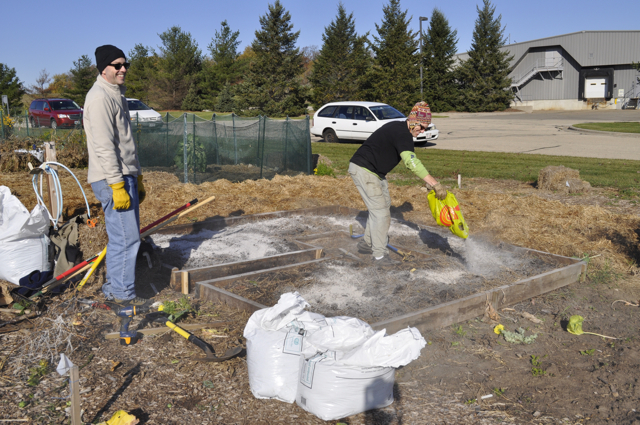 We talked about the produce that our gardeners have donated to local food pantries, and then the chat turned to our own plots. Nate has his mostly cleaned out, while I have lots left. I bemoaned my tiny brussel sprouts (both stalks and sprouts) compared to my mom's stalks that are twice as high as mine. 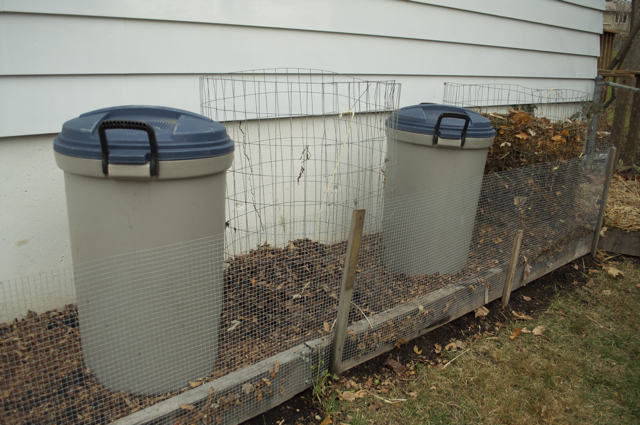 I explained my dim hope that the sprouts get a little bigger before a hard frost kills the plants. 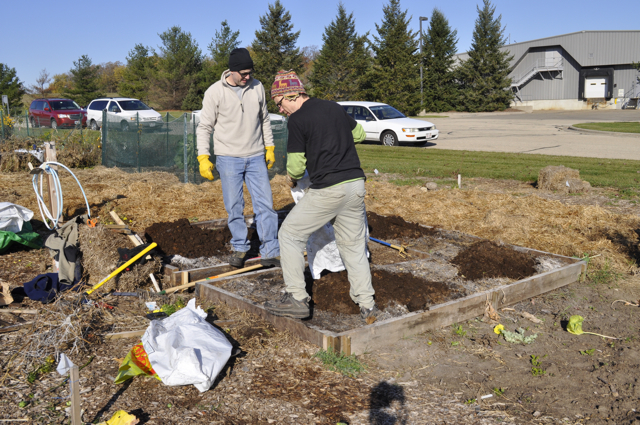 "Well you know," Nate said, "If you take the tops off the stalks, the plant will put more energy into growing the sprouts." Why hadn't I thought of that? Just last week I spent an hour trimming flowers off my tomatoes to force them to move those green fruit along. But Nate had one more thing to say on the subject. "You can eat the tops." My mind raced to memories of a cabbage soup that I just adore, and I imagined that these brussel sprout leaves would be very similar to cabbage leaves. 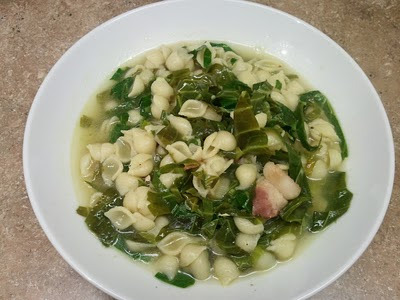 After work today, I chopped those tops off and took them home and made one of the simplest yet tastiest soups I know of. And yes, I'm going to share the recipe with you. Thanks Nate, for a delicious dinner! 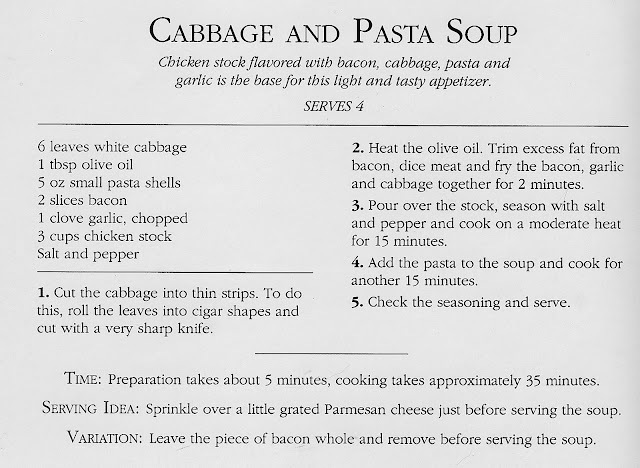 One of the few times I'll eat meat - bacon makes this recipe. I can't leave a recipe alone (due either to ingredient substitution or an excessive appetite for food experimentation). I used waaay more brussel sprout leaves than the equivalent of 6 leaves of cabbage, double or triple. Cooked 4 slices of bacon (more leaves needs more bacon) and I don't use olive oil (there's plenty of bacon fat). And 1 clove of garlic? How about 5? I also use Better than Bouillon Not Chicken broth. 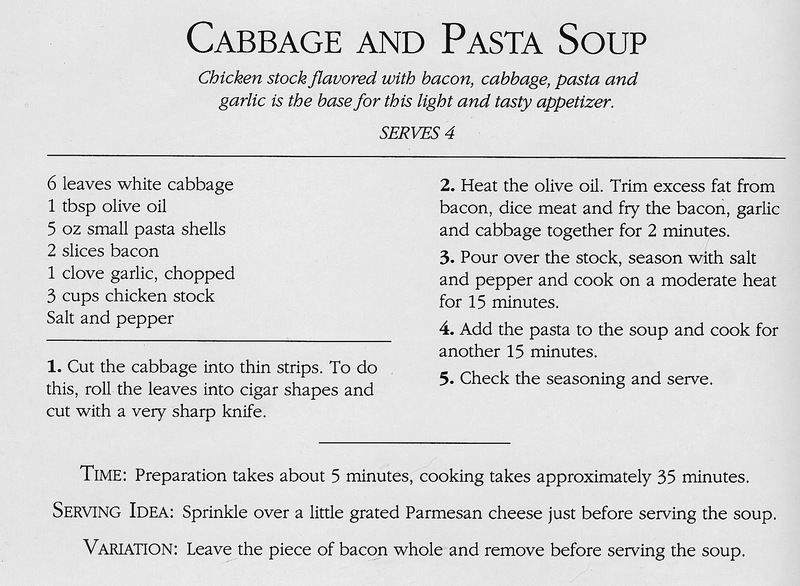 From Modern Cooking, Creative American Cooking with an International Flavor, Landoll's, Inc., 1996. Radio entertainer and host of A Prairie Home Companion, Garrison Keillor, was a staple of my childhood Saturday evening entertainment on the farm. One story still resonates in my head. 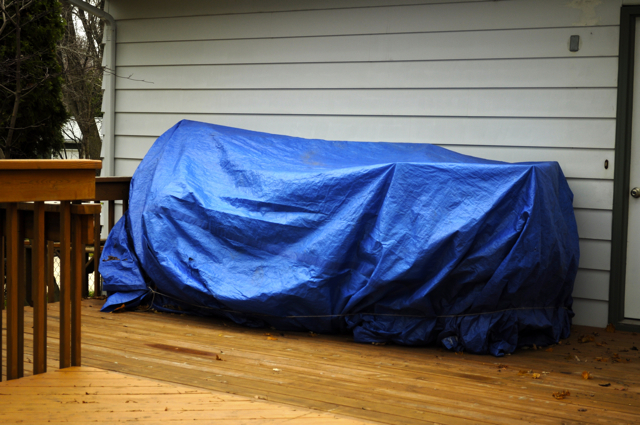 In one of his "Lake Wobegon" monologues, Keillor commented on how safe his town was, that people never locked their car doors and would often leave the keys when parking in town -- except in August. No, in August, doors were locked and car windows rolled up despite the summer heat, because to leave a car unlocked meant risking the inevitable -- someone would leave a bag of zuchini in the car. 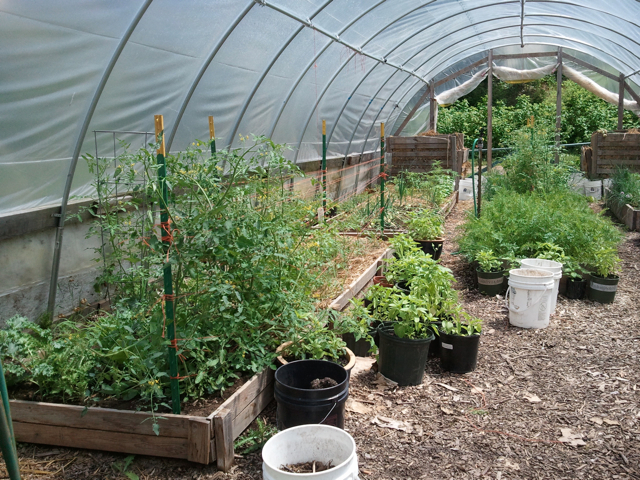 One of the challenges of gardening, urban or not, is to grow just enough vegetables that the gardener can eat immediately, put up or give away and not have so much that produce goes to waste. This is a great challenge because there are so many variables at play; soil type and fertility, rainfall or ability to water, seed or plant health, plant variety, insect damage, temperatures, etc. 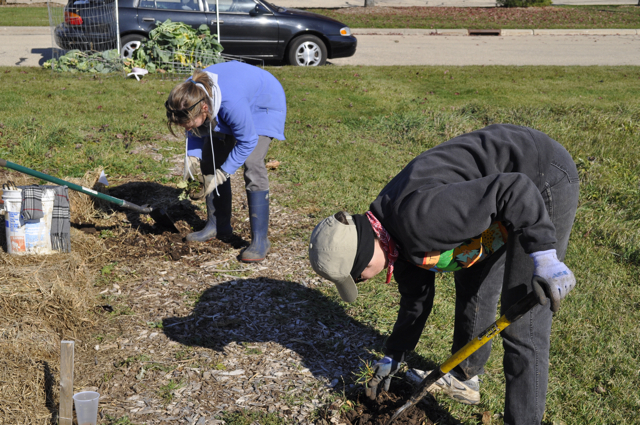 It's likely that many gardeners put a lot into the ground hoping that sheer numbers will overcome any of these adversities. 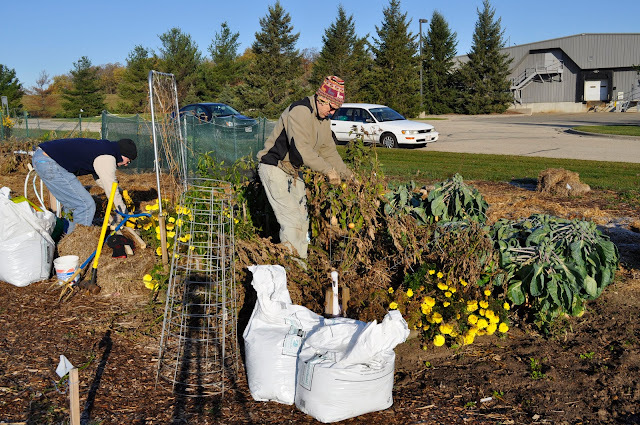 And this is all well and good, until an urban gardener with a country perspective walks through a community garden and sees tomatoes fallen to the ground, yellowing cucumbers or oversized zucchini. 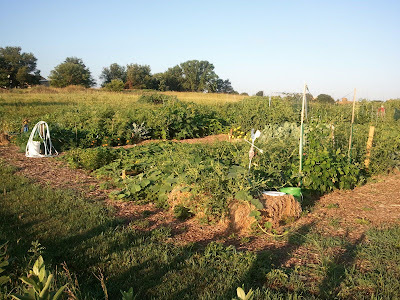 I not only grew up on a farm, I grew up with a "waste not, want not" mentality due to a pretty tight food budget and a very large garden. 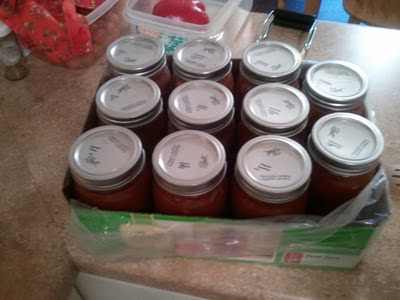 My mother canned, pickled and froze much of what we grew and didn't eat immediately. I'll never forget one summer afternoon, after canning 80 quarts of tomatoes, my mother said with great satisfaction, "If we run out of food, at least we'll have tomatoes." 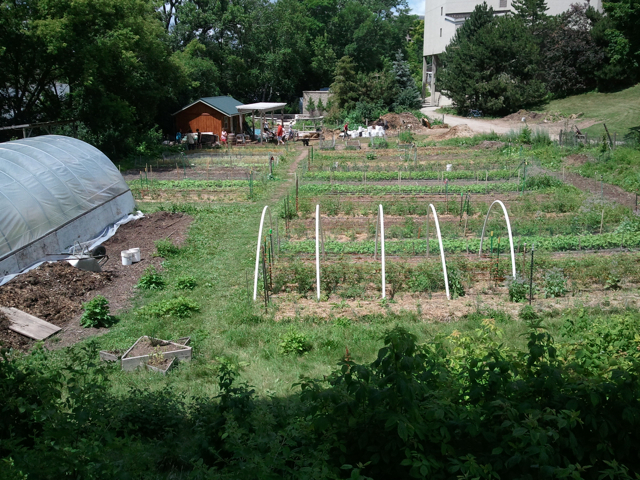 So I took a mid-August walk through the new American Family community garden to see how our own gardeners were harvesting (or not) their produce. This is what I found. 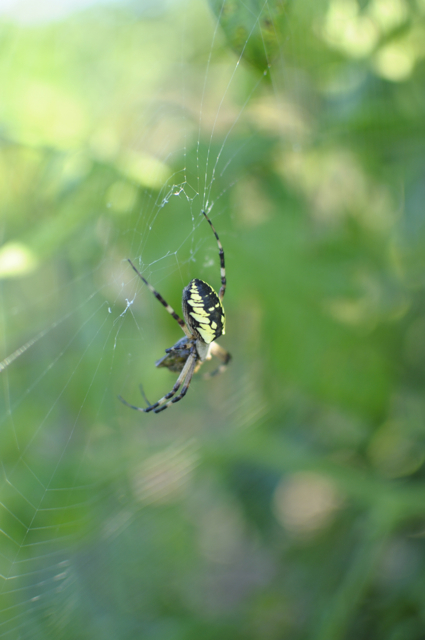 The garden is home to many insects - I grew up knowing this as a garden spider. It was feeding on another insect - go spider! 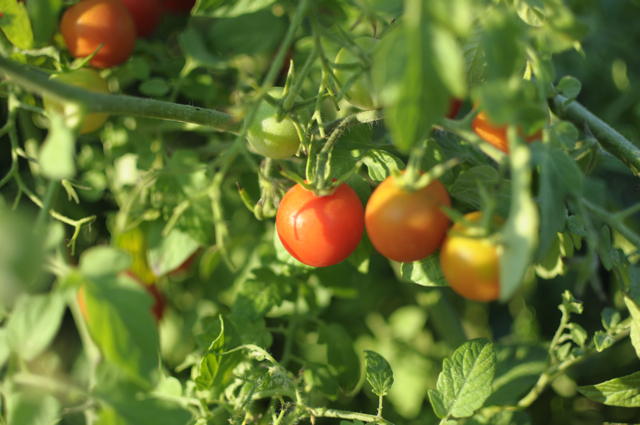 These cherry tomatoes are ready to harvest. What you don't see is this gardener planted several cherry tomato plants and there is a lot of over ripe fruit on the plants and on the ground. This is from my garden, an asian eggplant that had some sort of rot. 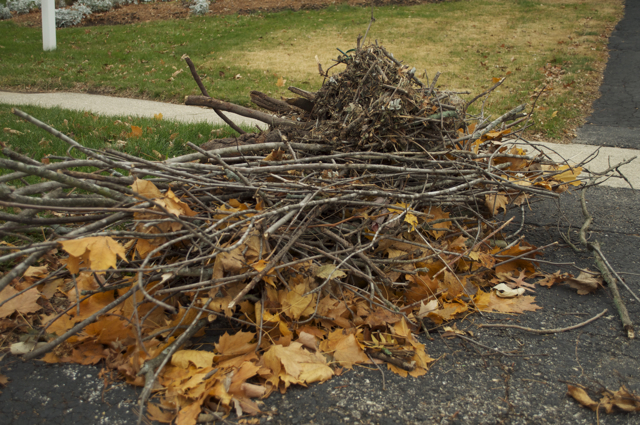 Had I harvested it earlier, it may not have rotted where it touched the mulch. 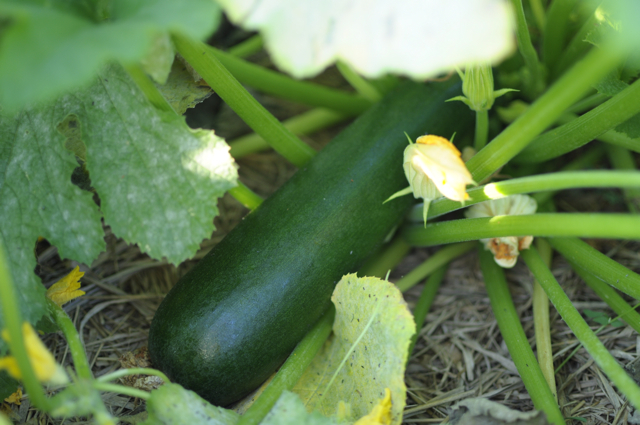 The infamous zucchini, this one ready to harvest. I was glad not to find boatloads of boatsized fruit - yet. Late August is upon us. Lettuce gone bad. I wouldn't want to meet this in a dark alley. Basil going to flower. It's beautiful, and the bees love it, but when basil is allowed to flower, the plant thinks it's done its job and wraps up for the summer. 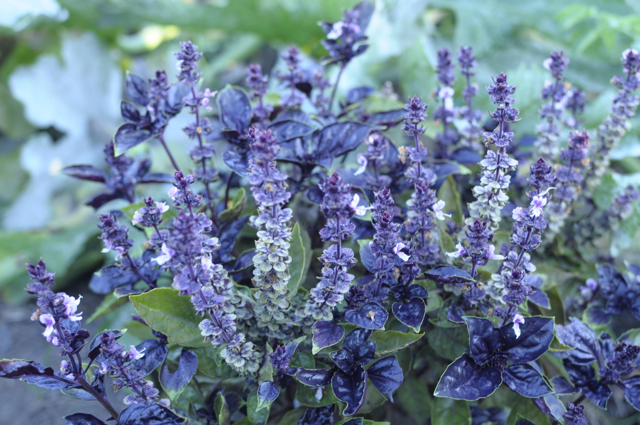 Unlike cilantro, a well-trimmed basil plant will keep producing - think an endless supply of pesto or caprese salad. 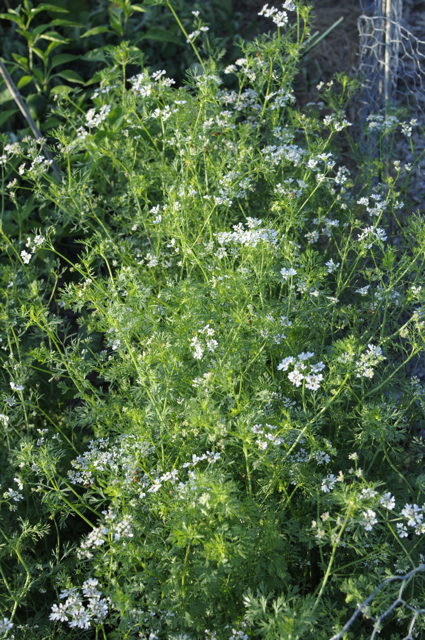 Can't blame the gardener for this, cilantro bolts no matter what you do. 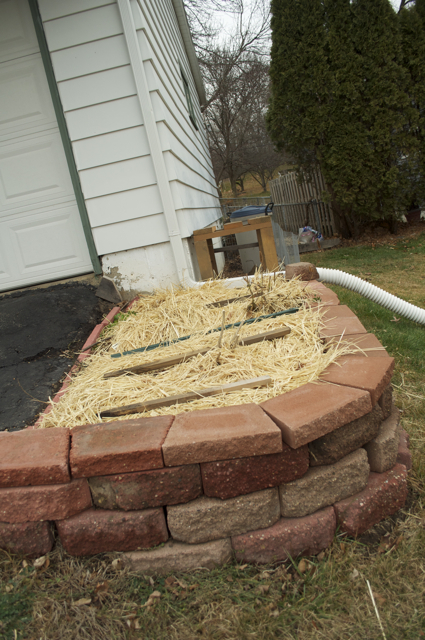 Suggestion: pull it out and plant more; you'll have fresh cilantro in a couple of weeks. Request: don't let it go to seed or your neighbors will have cilantro - everywhere. 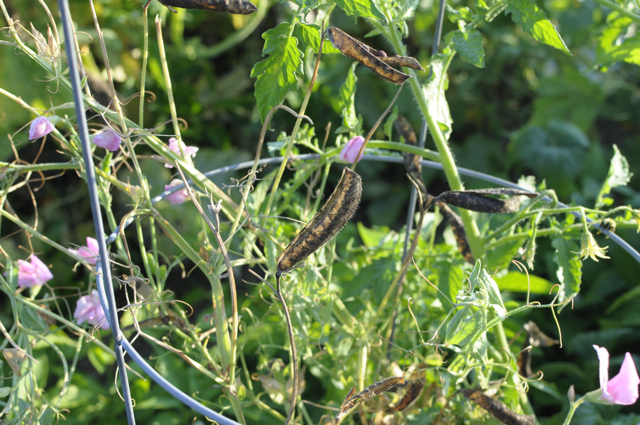 This makes me sad; an ignored and unharvested variety of sugar or snow pea. 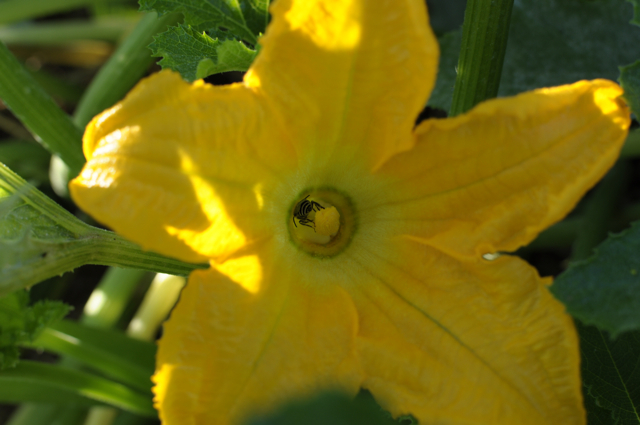 This makes me happy, a bee in a squash blossom. 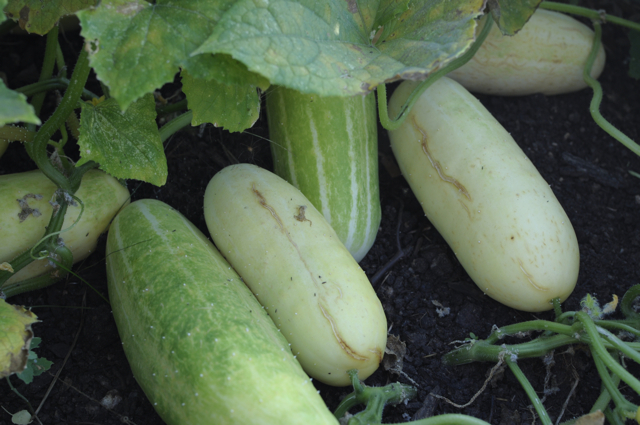 Swollen cucumbers. None of these are food-grade produce anymore and need to be removed to the compost pile before they turn to mush and insect party dens. I'm not sure if these are "decorative" peas/beans; the blossoms are lovely. 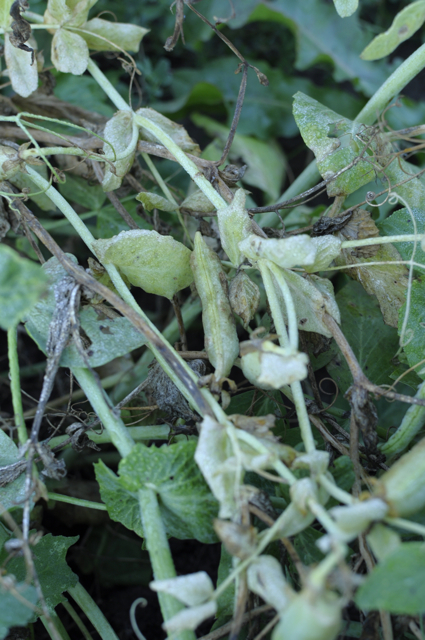 But the vegetables are desiccating on the vine and could have been somebody's food. 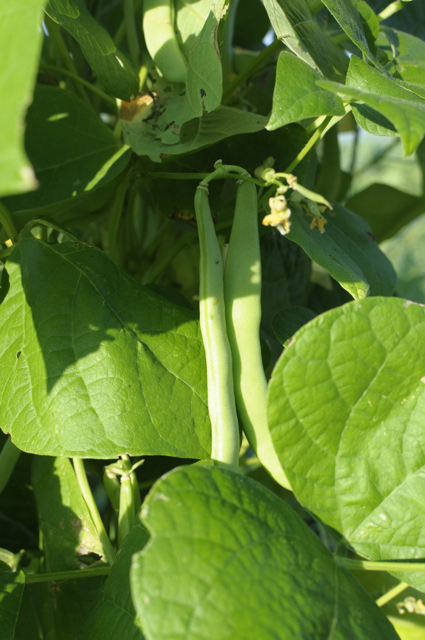 The bean on the left is good to eat, the one on the right is getting a bit big but certainly edible. Within a few days, however, no one will want to eat this lovely food. Thanks for reading and looking at photos. 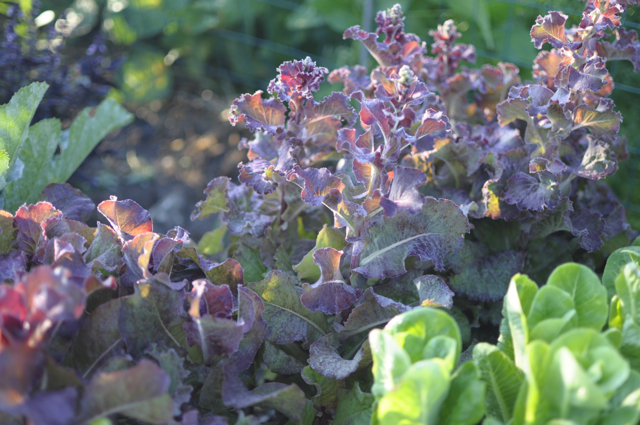 I'll post some ideas about what to do with excess produce in a future blog post. 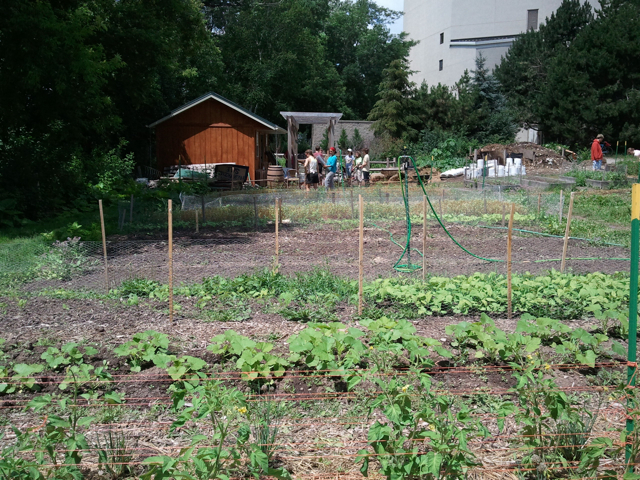 Brian Hudelson from the UW Extension plant disease diagnostic clinic spent his lunch hour with about 20 gardeners at the American Family community garden to see what's bugging our plants. I plan to pull out short segments of the talk, but the first has to be what he says about Japanese beetle traps. 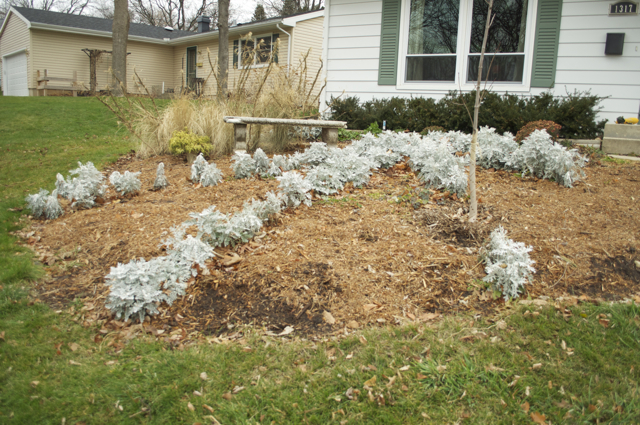 In 90 seconds, he tells us what he thinks of them, where to place them and a bit about the Japanese beetle lifecycle.